Comfortable apartment in the center of Athens, situated in a strategic position: public bus stop right in front of the building, only 70m to the nearest metro station, 100m from the Main Railways station, and on a walkable distance to all the major central business and tourist attractions (20-30 min relaxing walk to Acropolis and Monastiraky). The apartment is located in residential area surrounded by many hotels, big supermarkets (Carrefour 100m, Bazaar 50m, SPAR 150m), bakeries (50m), restaurants, bars and taverns (20-100m), sports' playgrounds (10m away), parks and piazzas (20-100m), church (100m), a school is just across the apartment. The National Archaeological Museum is located on the end of our street (1km). The apartment is renovated in April 2015. and fit up with all brand new furniture and home applicants. It's decorated in a modern style with warm, comfortable and pleasant natural colors and materials highlighted with some contemporary spots and shiny decorative elements. The 50 sqm bright and shiny apartment (facing the South) consist of: a bedroom with a king size bed (190 x 210 cm) and access to sunny balcony; living room with 2 pull-off sofa beds (130 x 195 cm); fully equipped kitchen (new modern cooker with oven, toaster, coffee machine, elect. water boiler kettle, fridge, dinning sets, cooking potteries...); dinning place and bathroom. That makes the apartment very comfortable for up to 4 adults and it can also additionally accommodate 2 kids more (on a special request). 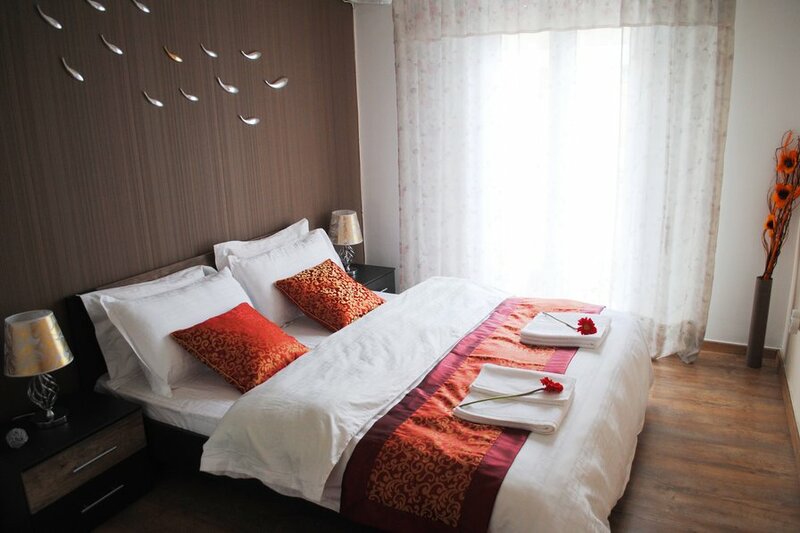 Highest quality 5* cotton bed linen and towels are provided as well as hair dryer and iron. For the entertainment we offer you: brand new 32'' LED flat TV with 30 Greek and International digital channels (MTV, BBC, DW, TV5...) and several radio digital channels, Media TV box player with a TV SMART functions with YouTube, Facebook, Twiter, Skype, Messenger and all other Android app), a huge collection of Greek and Athens related movies, cartoons, documentaries, video guides, digital photos and maps, helpfull tips and information and useful guide app. During your stay you can also use books (belles lettres), Athens and Greece guide books (only in the apartment), maps, power bank, selfie stick. As an experienced travelers we know nowdays travelers problems and needs on the road, so we provided you with universal multinational electrical plugs and sockets as well as adapters and chargers for almost all kind of mobile phones and other chargeable devices. Apartment is equipped and suitable for couples, family with kids, group of friends, elder people, single travelers for both tourist and business purpose.